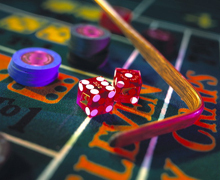 Craps game is one of the most popular casino games in America in casino history. Many gamblers consider it to be very complicated, but its rules are quite easy and understandable. At the first look on betting fields a novice player may be confused, as there are so many choices and possibilities. But let's try to analyze everything together and find out craps strategy. Each of two dice has even possibility of coming up on any of points between 1 and 6. That's why the number of probable outcome of craps roll is 36 (talking about each die independently). The resulting number of two dice may be between 2 and 12. The possibility of rolling total 2 ("snake eye") is 1:36. Total 12 points possibility is 1:36 ("box cards"). Players make bets on the "pass line" or "don't pass line". They are only options. "Pass line" means that the player puts bet on 7 or 11 on the first roll. If it comes 2, 3 or 12 this bet loses. "Don't pass" bet wins even money if the shooter shows 2 or 3. Other numbers are considered to be "point" (4, 5, 6, 8, 9, 10). They are called "come out roll" results. If fall out any of the "points" the main goal of game becomes to roll the same the number again. The "come" and "don't come" bets are alike with "pass"/ "don't pass". The "come" wager is possible after shooter's establishing of the point. Always remember that the "odds" bet is most convenient for the player not only in craps, but in the whole casino - the house edge there is 0. It is not clearly signed at the table, so inexperienced players usually don't notice it. Don't play the wager, if you don't understand it. The house advantage is bigger if there is big difference between true odds and payout odds.